The Israeli occupation army has refused to disclose their rules for opening fire on Palestinian protesters along the eastern borders of the Gaza Strip, Israeli newspaper Haaretz reported on Monday. The refusal came after a petition filed by a number of Israeli and Palestinian rights groups, to the Israeli High Court of Justice, requesting clarification of policies regarding the demonstrations of the Great March of Return started on 30 March, in Gaza. Rights groups, including international ones such as Human Rights Watch and Amnesty International have repeatedly called on Israel to stop using live ammunition against peaceful protesters in Gaza. Due to the Israeli disregard for human rights and rights groups, regarding the continuous use of live ammunition, Amnesty International has called, twice, for imposing arms embargo on Israel. 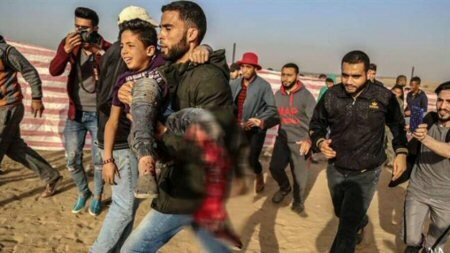 Days of Palestine further reports that, since the beginning of the Great March of Return,, Israeli occupation forces have killed 49 protesters, according to the Palestinian Ministry of Health in Gaza, and wounded thousands, including more than 140 who suffered very serious wounds. The demonstrations are part of a six-week long march which started on 30 March, and will culminate on 15 May — the 70th anniversary of the Palestinian Nakba, when Zionist paramilitary drove hundreds of thousands of Palestinians out of their homes from historical Palestine and demolished their villages, cities and homes.